Two extreme AC72 foiling catamarans with wing sails went head-to-head at over 40 knots in San Francisco Bay, California. The teams were competing in the 2013 Americas Cup Challenge which took place from September 7-21, 2013. Anyone watching the first few days of Americas Cup sailing will know that it looked like Emirates Team New Zealand had a seemingly untouchable lead – then out of the blue Oracle Team USA completed one of the greatest comebacks in sport to win the 34th America’s Cup. 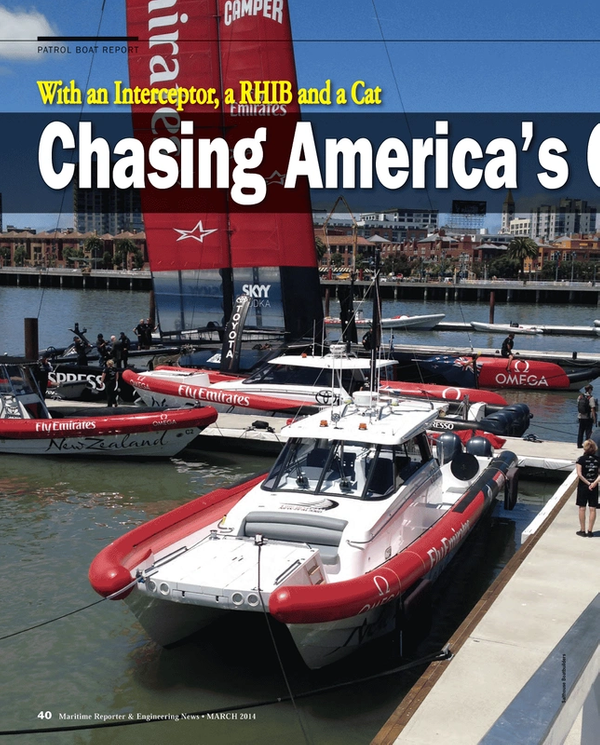 For anyone who has watched the rising speeds of sailing records plus the development of hydrofoil technology, this event was also bound to be a game changer for ‘power versus sail.’ Another race was on in San Francisco Bay as Chase Boats and Umpire Boats utilized gasoline and diesel engine horsepower versus the AC72 boats utilizing wind energy, aerodynamics and hydrodynamics. The AC72 is a state-of-the-art design wind powered craft. Overall length is 86 ft. (26 m), waterline length is 72 ft. (22 m) and it has an extraordinary beam of 46 ft. (14 m). The boat only weighs 13,000 pounds (5900 kg), it has a maximum draught of 14 feet (4.4 m) and is handled by a crew of eleven. The AC72 rises out of the water on foils and designers always expected it to sail faster than the wind. Predictions were upwind at 1.2 times the speed of the true wind and downwind at 1.6 times the speed of the true wind. But the AC72 has proved to be faster, averaging about 1.8 times the speed of the wind, with peaks slightly over 2.0 times the speed of the wind. The extreme foiling catamaran design means that AC72 racing takes place on the edge of control. There is potential for crews to fall overboard or to require immediate attention in case of injury. Each team is allowed a Chase Boat and to provide a margin of safety these high speed craft need to not only match the race boat speeds, but to be able to exceed them. The crews try to avoid the dangers of a capsize but it is a possibility that support teams must plan for. Most conventional power craft cannot fulfill the demanding task of supporting the 72-ft. Americas Cup catamarans that can accelerate to 40 knots in seconds. The power boat ride quality has to allow for keeping up with an AC72 for an entire day, regardless of how fast the sail boat is going or what the sea conditions are like. The objective is to have a high speed craft that does not fatigue the crew and keeps the team’s paramedic and dive crews ready for action. This is high stakes racing with multi-million dollar investments by owners and sponsors. With money of less object than usual it is interesting to compare the various designs that the teams selected as Chase Boats. The racers also require a high performance Umpire Boat capable of following close to the action and providing instant visuals of the competition as it unfolds. A Willard Marine High Speed Interceptor was chosen by the Americas Cup Racing Association as the Umpire Boat for the 2013 Americas Cup. The 43-ft. (13 m) craft is powered by twin Cummins 600 hp inboard diesel engines and surface drive system. The Interceptor was developed for military use from a Scarab offshore racing design and can achieve speeds greater than 60 knots. Willard Marine teamed up with Larry Smith of Team Scarab to develop the design. Team Scarab has a 30-year heritage of designing and building world champion offshore race boats. The Interceptor was initially prototyped in response to a request by the U.S. Navy for a high-speed combat mission boat. The 43 Assault is also ideal for intercepting and boarding boats and vessels in the open ocean. Willard worked closely with Team Scarab to refine their Deep V stepped hull design in order to meet the U.S. Navy requirements, including shock mitigation seats and light weight engines. The Interceptor also has a Supplemental Stability System (S3) that increases the stability, passenger comfort and safety of heavily loaded high speed craft. The variable geometry of the sponsons increases hull efficiency and aft buoyancy where the fuel, engine and passenger loads are. Naiad Inflatables of Newport produced two custom built 42-ft. (12.9 m) RHIBs for Oracle Racing Team USA to support the Defender AC72 Yachts. Twin Yanmar 370hp inboard engines allow the chase boat to maintain the power, agility and endurance required to support the yachts through the variable conditions of San Francisco Bay at up to 45 knots. Naiad has a strong legacy of involvement in the Americas Cup, dating back to tenders produced for Challenge New Zealand for the 1992 event in San Diego. Naiad was the first company to develop a RHIB more than 40 feet specifically designed to carry the large fully battened mainsails, unique at the time to the IACC class of Americas Cup race yachts. These vessels were used by Team New Zealand, which successfully challenged for and won the Americas Cup in 1995 and successfully defended the Americas Cup in 2000. In addition to Team New Zealand, two of the challengers had Naiad boats custom built for the 2000 Americas Cup. The 46-ft. (14 m) Naiad Ranger was the first shaft driven inflatable, she was custom built to tow two of Young Americas IACC yachts simultaneously. This platform spawned a whole new class of diesel shaft commercial RHIB vessels for towing and pilot boat use. Morrelli & Melvin designed a 45-foot (13.7 m) 1,200 hp high-speed catamaran as Tender and Chase Boat for Emirates Team New Zealand AC72. The concept was developed in collaboration with ETNZ and Salthouse Boatbuilders. The ETNZ chase boat is powered by four 300hp Yamaha V6 four-stroke outboard engines and has a top speed of 58 knots. The fiberglass hull is topped with inflatable tubes allowing it to slip in beside the AC72. The ETNZ boat includes a protected main deck cabin, head, and large storage area under the foredeck. The craft has four engines to deliver the power needed to right a capsized AC72. Running all four engines at 3,000 rpm gives 30 knots and the boat uses 100 liters of fuel an hour. The boat holds 1,700 liters of fuel which gives a range of 510 nautical miles or 17 hours running time at 30 knots. There is plenty that the military and professional fast boat sector can learn from this unique situation where craft are pushed to the limit for days and weeks. Congratulations to all the racers and support teams that made the 2013 Americas Cup an outstanding event and raised the bar for power versus sail.